Hello and happy Friday! I started the week with a fun girl card and wanted to wrap up the week with another. It's always a treat for me to play with colors, patterns and icons outside my norm of snips and snails and puppy dog tails. Such is the life of a mom and scrapbooker of a little boy. I made this card, Hello Beautiful, from the pretty Fern and Forest Girl collection from Little Yellow Bicycle. It's the counterpoint to Fern and Forest Boy and shares some of the same patterns but in a different color palette. I love that Little Yellow Bicycle is purposeful in catering to both genders. I chose a bright purple-y herringbone paper as the base of this card and added transparencies as photo corners. The transparency was a small frame from the LYB Clear Cuts and I snipped off 2 corners rather than using the frame as intended. It's always tricky to adhere transparencies so that the adhesive doesn't show. Here, I just stitched right over it. Perfect solution. 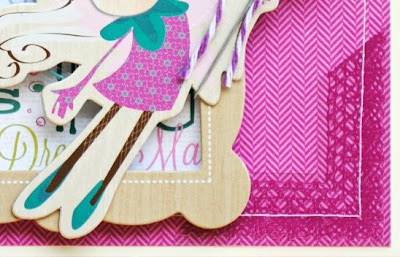 I loved the colorful chipboard pieces in this collection and featured them on the card by building a frame, pop dotting some elements. The swirl is another Clear Cut and here I hid the adhesive by gluing it to the back of the fairy princess and under the "beautiful" banner. 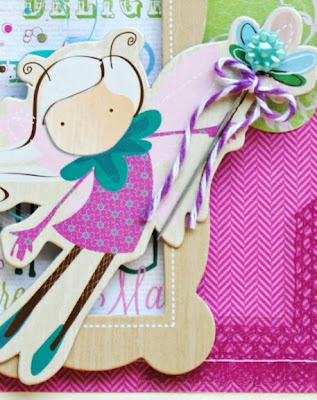 To finish the card, I added a stick pin as the fairy's wand and tied it with a bit of twine. If you have followed my work, you know I am a HUGE fan of Little Yellow Bicycle. I'm so pleased to announce that I now have a new badge to add to my sidebar: Little Yellow Bicycle is officially sponsoring me. I'm tickled pink! So adorable! I love how you dressed up her wand!!! this is so awesome izzy! totally love the colors on t his and what a perfect little girl card!! Such a pretty pairing of elements, Izzy and a super sweet girl card. Congratulations on the sponsorship! Love your fun girlie card!! That is so incredibly awesome! Congrats on the sponsorship!! They're sponsoring you?! Awesome!!!! Your cards are always so beautiful Izzy! oooooo total Congrats for the sponsorship. I love the card. Its so fun and colorful. It'd make anyone smile. This is gorgeous!! I love love love the colors and loveeeeee the fairy!! I love all the details. The fairy wand pin is really cute and I like how you used a frame for the pattern paper. TFS! Gorgeous card izzy!!! Cute fairy wand pin is extra cute!! Congrats and love the card!! Congratulations, Izzy! That is so highly deserved! BiG Congrats Izzy! I LOVE everything that you create! Very cute card!! Love the colors!